4-6 p.m. Opening night of an exhibition of works by renowned artist Luba Kostenko (St. Petersburg-Amsterdam). Organized by Professor Earle Lomon, Saskia Ozols Eubanks, and Ivan Eubanks, with the assistance of Misha Lenn. MIT Center for Theoretical Physics, 77 Massachussetts Avenue, Building 6, Third Floor, Cambridge. 6-8 p.m. Meet Luba Kostenko: Introduction by Saskia Ozols Eubanks, followed by artist's presentation, slide show, and reception. (By invitation) Harvard Club of Boston, Aesculapean Room. 374 Commonwealth Ave., Boston. 7 p.m. Collaborative Russian-American performance of Hans Krasa's children's opera Brundibar at the Lincoln School, Brookline. Introduction: Samantha Gelfon. Russian performers: Children's Studio of the St. Petersburg Musical Theater, "Zazerkalie"
11 a.m.-12:30p.m. Presentation by Jennifer Thomas on Steve Reich's Different Trains for the Boston University community. Kenmore Class Building, Room 107. 565 Commonwealth Ave., Boston. 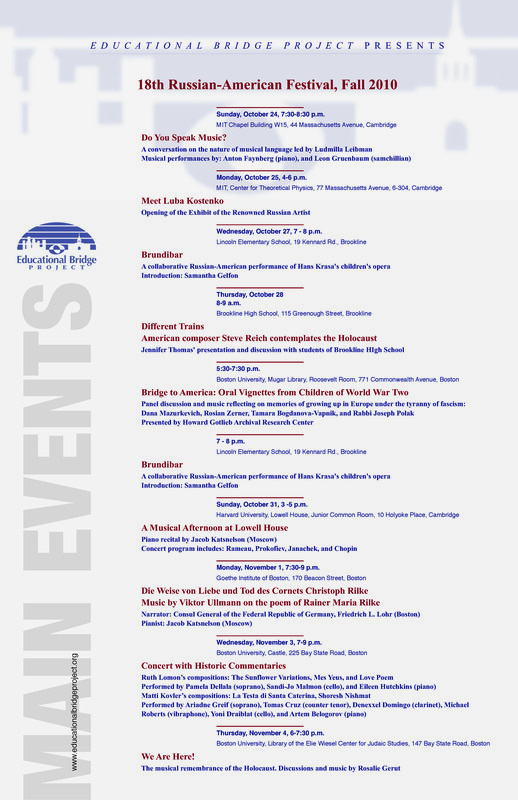 5:30-7:30 p.m. Bridge to America: Oral Vignettes from Children of World War II. Panel discussion featuring Dana Mazurkevich, Tamara Bogdanova, Rosian Zerner, and Rabbi Joseph Polak. Songs of the war era performed by the enslemble Lucky Ten (Alexander Prokhorov-director), and musical composition, Wiegala, by Julia Carey. Reception to follow. Boston University, Mugar Library. 771 Commonwealth Ave., Boston. 11:15 a.m. - 12:20 p.m. Brundibar-at Brookline High School, for Carolyn Castellano's class “Writing Music on the Computer”. 115 Greenough St., Brookline. 4-5 p.m. Brundibar-at the Boston University Humphrey Fellowship Program. 704 Commonwealth Ave.
3 -5 p.m. Piano recital by Jacob Katsnelson, tour of the Bell Tower, reception. Concert program includes Rameau, Prokofiev, Janachek, and Chopin. Harvard University Lowell House. 10 Holyoke Pl. Camridge. 7:30-9 p.m. Concert with Historic Commentaries: Ullmann-Rilke, Die Weise von Liebe und Tod, narrator Consul General of the Federal Republic of Germany, Friedrich L. Lohr (Boston), pianist Jacob Katsnelson (Moscow). Introduction Ludmilla Leibman. Reception to follow the event. Goethe Institut of Boston, 170 Beacon Street.